"When you grow up, you'll have to catch your own food," Dunbar's father said. "In fact I think it's time I sent you out to catch your first animal for supper. If you don't, you'll go to bed hungry." "Papa, what should I catch?" Dunbar sighed. Inside he shook with fear. "I'm scared, Papa." "It's time, Dunbar. Start small. Maybe you could find a sheep, or a calf, or pig. Go and find your supper." 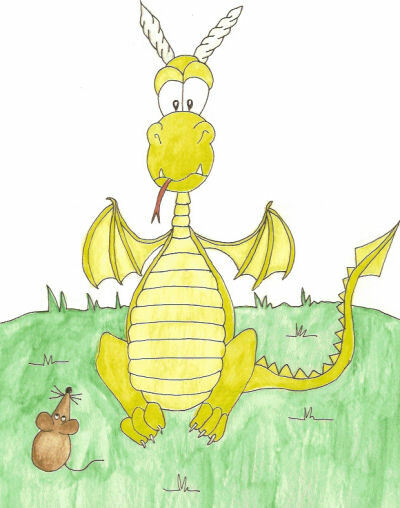 Dunbar's father didn't like making his son feel scared, but knew a dragon had to learn to catch his own food. The world was tough on dragons. Dunbar flew into the air. 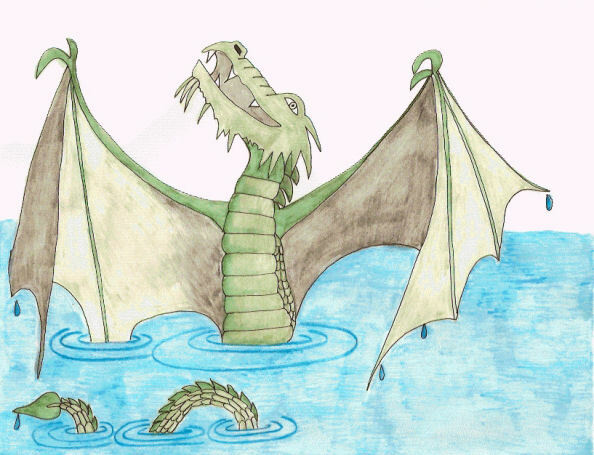 He turned to see his papa in the loch, his wings spread to the side. Dunbar waved goodbye and headed for the green rolling hills. "I'm so scared. I can't catch a sheep! What if it bites me?" He flew a little further, looking down. "I can't catch a calf. What if it's papa is nearby and attacks me with those big horns. Oh my. I'm so scared. What should I do? I'm hungry too. I wish mama was here." Dunbar landed near a large boulder and sobbed. "Someone help me. I don't know what to do." Just then a mouse stepped out from behind the boulder. "I can help you. What's wrong? Why are you crying? Say, are you a dragon? Do you breathe fire?" Dunbar stared at the mouse. Willie stared back at Dunbar. "What's the matter," the mouse said. "Can't you speak?" Dunbar wiped a tear away. "I'm hungry. My papa said I had to find my own supper tonight, but I don't know how to catch food." Willie chuckled. "Do you like cheese? If you like to eat cheese, I know where a whole barnful is." "What's cheese? Is it like a cow, or a pig?" Dunbar licked his lips. Cheese sounded good to him. "It's better. Follow me." Willie led the dragon through the forest. They came to a building. "There's a lot of cheese in there. There's also a cat in there too." "What's a cat? Can I eat a cat?" "Cats are all furry and all bones. I'll tell you what. If you'll go into the barn and chase the cat away, I'll share all that cheese with you. Is that a deal?" Willie grinned and twitched his whiskers. "It's a deal. What do cats look like?" "The one in there is black with a long tail. It makes a sound like this, 'meow'. Go get it." Willie stood back and watched as Dunbar ran into the barn. He heard a few screeches, meows and roars and then Dunbar marched out of the barn with the cat in his mouth. "You caught him. Way to go, Dunbar! Take him to the loch and throw him in it." Dunbar ran off and did as told. When he got back, Willie stood near the door to the barn. "Come on, Dunbar. You'll love cheese." Dunbar's tummy rumbled. He followed Willie inside. Piles of cheese were stacked neatly on a shelt. The two of them devoured every piece. "That was good," Dunbar said. "It was easy to catch" He patted his plump belly. "I'd better go home now and tell my papa. He'll be so proud of me." "Uh, Dunbar, I'd let this be our secret. Don't tell your papa. He'll see your belly and know you've found something for supper. Come back tomorrow and we'll have some more. All you have to do is get rid of the cat." Willie waved as the dragon flew away. Dunbar saw his papa in the loch. "Papa! I caught my own supper tonight. I'm so full." "That's my boy," his papa said and then the two of them flew back to their cave. Never again did Dunbar go hungry and he never had to worry about catching sheep, pigs or cows.